Ah, the trend map. Anytime there’s major holiday or event on the horizon, here come the infographics and trend maps to let us know what everyone around the country is searching for and planning to do. Sometimes, they’re useful or interesting. Most of the time, however, they are really dumb or confusing as hell. 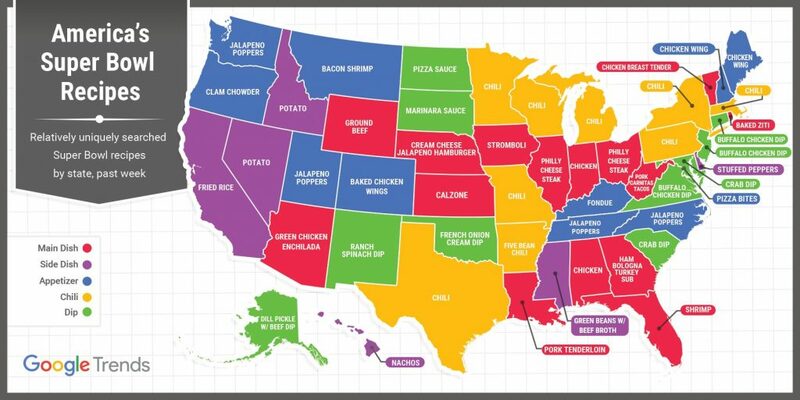 Take, for instance, this Google Trends map showcasing “uniquely searched Super Bowl foods by state.” Supposedly the idea is that, if you were to go to a Super Bowl party this weekend in each state, this is what you might find in the spread alongside traditional dishes such as chili, pizza, nachos, and chicken wings. And according to Google Trends, we all want some rather interesting things. Mostly, it’s what you might expect. A lot of state love dip, be they seven-layer, spinach, Buffalo chicken. But then the map says that Nevada’s most likely Super Bowl dip would be “vegan cheesy bacon spinach.” And look, we’re not going to besmirch vegans here. Everyone gets to enjoy what they want. But if you’re trying to convince us that the most likely dip you’ll find on a Nevada Super Bowl party table is purposefully vegan, we simply do not believe you. And that’s before you get into findings like Montana loving lentil soup, Idaho being all about that salad (unless it’s potato salad which makes a lot of sense), and California preferring “baked chicken breast.” Look, we know you’re not supposed to present anecdotal evidence against statistical evidence, but as someone who attended eight years of Super Bowl parties in Los Angeles, I can guarantee you I never went to one where anyone took the time to present guests with baked chicken breasts. It plays into the California stereotype pretty well but this seems patently absurd. And that’s the point, of course. We don’t know exactly what the parameters were that Google used in order to come to its conclusions. How does it know a search for a chicken recipe is Super Bowl specific? And does it just presume any search for a dip is Super Bowl-centric? Again, that’s the point. It’s less about us wondering how they came to the conclusion that Alabama loves granola bars while watching the Patriots and more about making fun of Alabama for eating granola bars during the Super Bowl (which we feel pretty confident is not true). It should be noted that Google has since updated the map to be about the uniquely searched recipes in the week leading up to the Super Bowl itself. This version seems to make a lot more sense. Most of the recipes are obvious choices, like chicken wings, jalapeno poppers, and chili. Of course, it still makes absurd claims like most people in Illinois are making Philly cheesesteaks (WTF) and every Super Bowl part in Kentucky will include fondue. 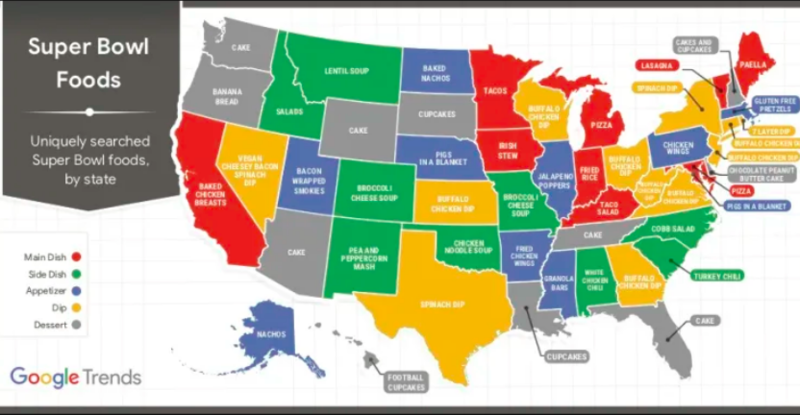 It’s also worth noting that, last year, General Mills released a map of popular Super Bowl foods by state, based on internal data from BettyCrocker.com and other GM-owned food websites. It paints a different picture about what people are eating during the Super Bowl (no salads and chicken breasts here). But it also kinda feels closer to true. We’d believe that everyone is gorging themselves with meats and chilis and queso dips long before we believe that other one.